Back when my kids were babies, I distinctly remember getting to tea-time and starting to panic. If you’ve got a colicky baby or indeed one who’s just tricky to put to bed or who struggles to stay asleep for long, you’ll know exactly what I mean. I used to start worrying about the bedtime routine hours before it was even time to begin. Nowadays that all seems far behind us - hallelujah - and I could wax lyrical about what works and what doesn’t when it comes to putting your baby to sleep, or coping with a baby who doesn’t really do night time. But instead, let me offer you six sleep aid suggestions. I can’t guarantee any of them will work on your sleep-resistant baby, of course, but I’ve only selected those which were some degree of help in our house (or which other friends swore by) during those dreaded years of struggling with a baby who just would not sleep. This is a weird yet clever little gadget that worked like a charm when my daughter was a few weeks old and struggled to drift off to sleep if she was even remotely overtired. It's a white noise baby calmer which means it transmits a soothing sound - you can choose from heart-beat, ocean waves or rain falling on a tin roof - which supposedly helps your baby to relax and nod off. I particularly like that it's handy enough to pop in your change bag and carry around with you, and found it worked well if nap-time happened to coincide with when we were out and about somewhere less than quiet and peaceful. My older two kids never really needed white noise to help them sleep, but my youngest definitely did - I'm inclined to think that she was so used to noise and chaos on account of having two older brothers that she actually arrived in the world needing to be surrounded by mayhem in order to feel normal. We hadn't yet discovered the Gro-Hush Baby Calmer then, but a friend told me about this video on You Tube of some dude hoovering for hours on end and it was pretty much the best thing that ever happened in our house. If you have a baby who loves a bit of white noise, you have to try it; you won't believe it till you do. Ewan is a cuddly little sheep which you can attach to your little one's cot bars or pop alongside them in the moses basket. He plays real heartbeat and womb sound combinations that mimic the noises babies hear inside the womb, and his soothing pink glow acts like a night light. There's also a choice of three further sound combinations which are suitable for older babies and toddlers including rain, vacuum cleaner and harp music. Probably my favourite thing about Ewan is that he's easy to take with you on overnight trips or just when out and about during daytime naps. Kids get seriously attached to this little lamb. This is one for the littlies. 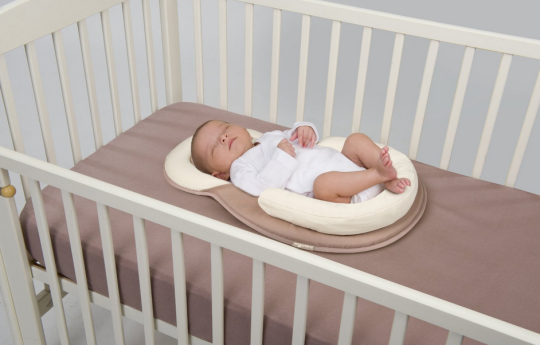 It's basically a super comfy sleep positioner which offers extra back support thanks to the built-in headrest, as well as more support for the legs which - so friends tell me - can really help with getting babies who suffer from colic or reflux to settle well enough to go to sleep. The fabrics are soft and breathable, and you can pop this inside baby's cot or moses basket as an extra means of sleep-friendly support. We've written about these before but I'd go so far as to say that I wouldn't travel away overnight without my daughter without theirs. It is quite simply totally brilliant. You can attach to windows of varying sizes within minutes thanks to the super-handy suction cups, and it's really handy to remove, too, so you don't need to worry about wrecking your holiday cottage or wherever you end up using it. A dark, sleep-friendly room in minutes, and it comes in a handy travel bag. Brilliant. This is basically a mobile unlike any other - the funky black and white spiral patterns made this so enticing to look at for all three of my kids that they were completely incapable of resisting its charms. I've bought these for friends as baby shower gifts whenever I've had the chance because it's that good at gently lulling little ones into a big old sleep mood. and when they're too little to use it as a mobile, you can transform it into a cute little music box so they'll always have something to listen to at bedtime and nap time that will seem familiar and comforting when they're trying to resist sleep. I mean drop off like a good little bubba. So there you have it. Six recommendations that just might put paid to your pre-bedtime routine panic. If you have any items that you'd add to this list, we'd love to hear about it over on our Facebook page.